Weekly practices for members of the Matsuri Crashers. Seeking 8+ new members. Intermediate/advanced players needed. With 8 members we will be able to cover room rental and LATI teaching support for only $65/mo. This works out to less than $10/hour! 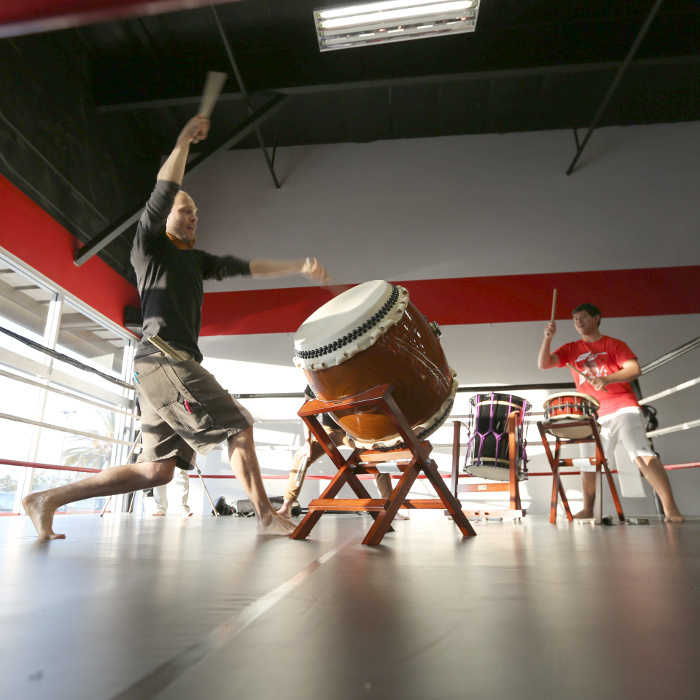 That's less than a yoga class, and we get to use the sound-proof Asano Taiko US facility and world-class taiko drums! Matsuri Crashers are dedicated to the development of slant-drum soloing and the inspiring base-beat rhythms that support the soloist. Practices divide time between in-depth drilling of movement and form for slant-soloists and small-drum technique and timing for jiuchi players. Members learn the six, inspiring Matsuri Crashers battle structures, and will develop the seventh, "60" structure, using the challenging and addictive "asalato" shaker from Ghana. (New members can purchase asalato through instructor.) Matsuri Crashers support the community battles that occur at semi-regular intervals around the country and prepare exciting new moves and rhythms for the taiko world. The Matsuri Crashers battles draw inspiration from the world of hip-hop dance, which has used light-hearted competition to inspire deep practice and amazing creativity. Hip hop dance is now one of the world's great art forms. Slant-drum solo performance sets a high bar for taiko artistry. The soloist carries the responsibilities of musical development and phrasing; a single drum *is* the performance. Compare this to the task of performing ensemble taiko music, with many players, often playing the same rhythm. For the slant-soloist, every hit counts. The stakes are even higher for the Rock Solids jiuchi players, whose responsibility is to support the soloist at all costs. When a soloist comes to the battle having practiced for months to debut their new move, the base-beat cannot falter, even with the heightened pressure and inevitable surprises of live performance. Matsuri Crashers grab hold of these great challenges to grow as artists and develop taiko as an artform. The Matsuri Crashers Battle setting places soloists (or pairs of soloists) in head-to-head competition and a jiuchi (base-beat) crew called the Rock Solids plays the supporting rhythms. Practices involve beta and naname nagado forms, plus small-drum technique, ensemble togetherness, and timing. Musical challenges range from moderate to advanced, tailored to individual and ensemble needs. Members learn all aspects of rice-pounding, from rice prep to pounding to presentation and clean-up.